Realto, Property sales, a website designers loves to work with clients that have a design background. When a web design firm and a client mesh it shows in the finial product. PX Media created a theme with an Architectural style built on top of a powerful Joomla CMS (the most used Content Management System (CMS) on the web). Curt’s business is based in Monrovia Calif. but he needed to attract clients from the sounding areas. We worked with Curt to market his business by adding SEO and a WordPress blog to his web presence. Real Estate website design in Monrovia Ca, is one of many Los Angels surrounding areas PX Media works within. Joomla Content Management System (CMS). Developed project speck for client. 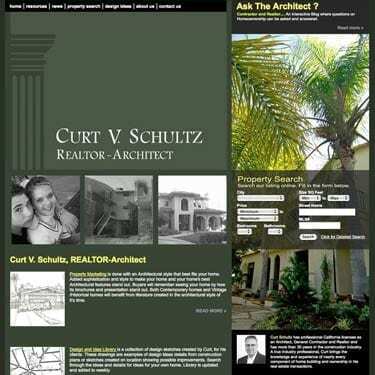 Curt Schultz Realestate Agent Architect. Monrovia, California.